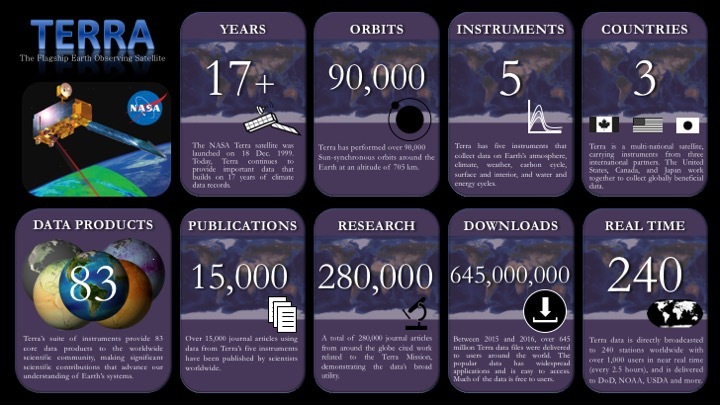 Terra Fact Sheet – An overview article about the Terra Mission published on the Earth Observatory. It also has images and animations of the satellite and instruments that could be useful in presentations. Terra by the numbers. Quick overview of Terra related statistics. 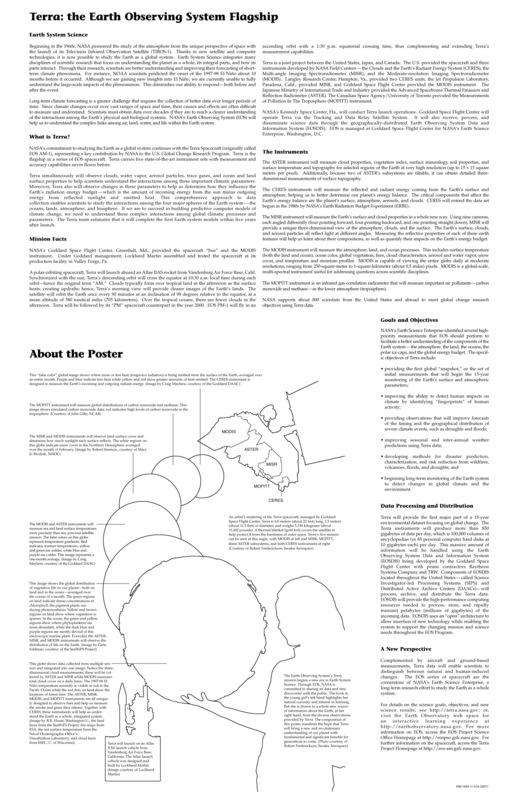 – Click on image to enlarge or download slide. 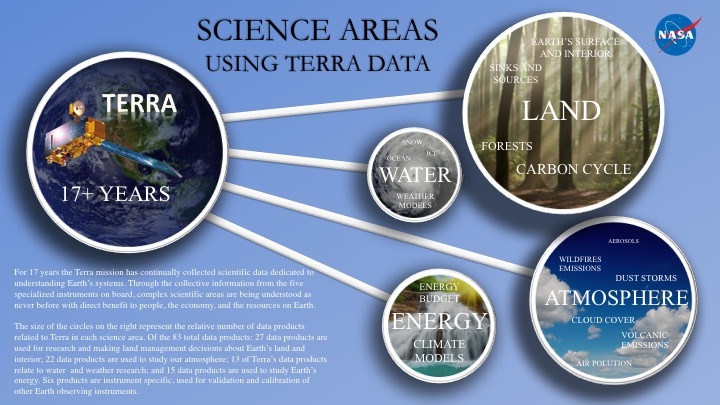 This slide shows Terra’s different science focus areas. Each circle size represents the relative number of data products in each of these science areas. – Click on image to enlarge or download slide. 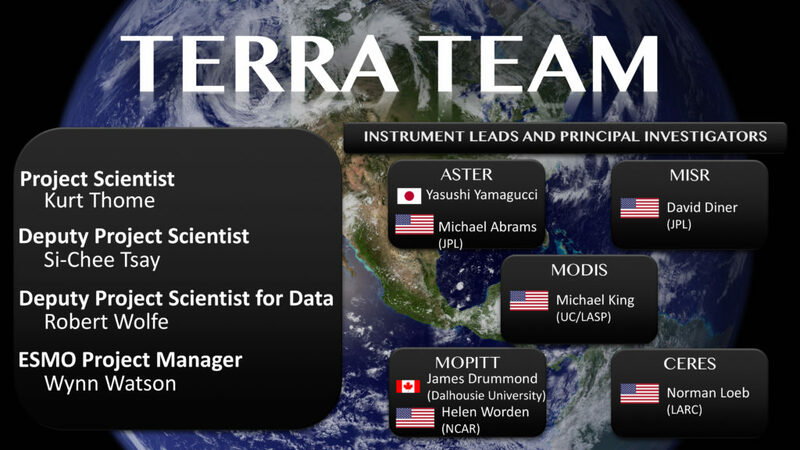 International Terra Team Members as a slide for presentations – Click on image to enlarge or download slide. 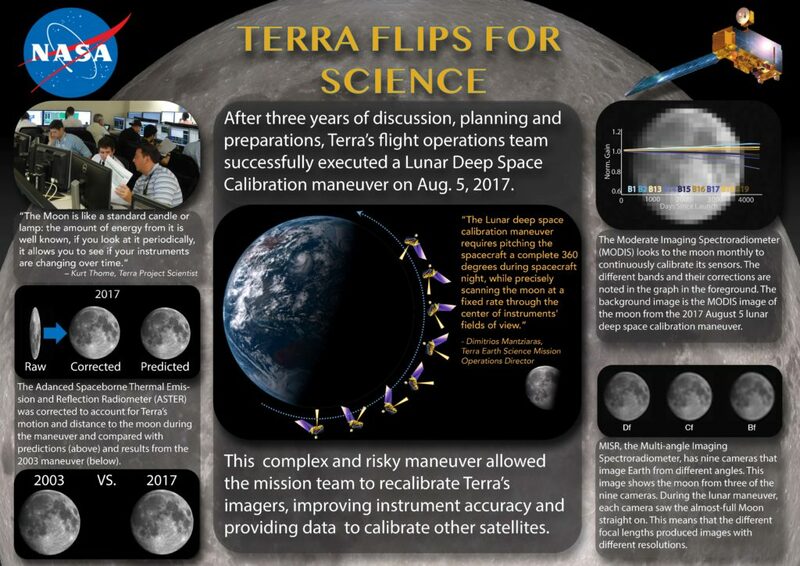 On August 5, 2017, Terra’s Flight Operations Team successfully completed a Lunar Deep Space Calibration Maneuver I – Click on image to enlarge or download poster or slide. 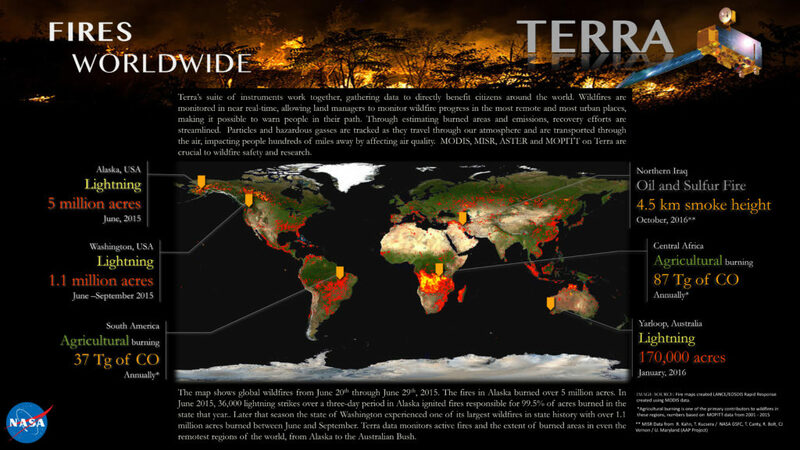 Poster and Slide about Fire Science with Data from MODIS, MISR, ASTER and MOPITT – Click on image to enlarge or download slide. Presentations given by Terra principal investigators and engineers during Terra’s 10th anniversary celebration in May 2011. A short course presented by Terra principal investigators to graduate students at La Scuola per la Societô dell’Informazione, in L’Aquila, Italy, in September 2002. A collection of presentations about Collection 6 (C6) from 2014 that outline the changes made to Levels 2 and 3 MODIS data. A digital collection of NASA Earth and space science resources for educators of all levels – from elementary to college, to out-of-school programs. These resources, developed through funding of the NASA Science Mission Directorate (SMD), have undergone a peer-review process through which educators and scientists ensure the content is accurate and useful in an educational setting. Use NASA Wavelength to quickly and easily locate resources, create your own collections within NASA Wavelength, connect them to other websites using atom feeds, and even share resources through social media. The S’COOL Project involves students (ages 5-20+) in real science, making and reporting ground truth observations of clouds to assist in the validation of NASA’s CERESsatellite instruments. Teachers are welcome to register with the S’COOL project to join their students with others around the world who are learning about clouds. Individuals can also contribute observations through the S’COOL Rover area of the website. A tool that allows anyone to make use of satellite data that was previously unavailable. Through the use of MND’s Live Access Server (LAS) a multitude of charts, plots and graphs can be generated using a wide variety of constraints. This site provides a large number of lesson plans with a wide variety of topics, all with the students in mind. Not only can you use our lesson plans, you can use the LAS to improve the ones that you are currently implementing in your classroom. NEO is your source for global data imagery from NASA. The global data sets are interactive allowing users to look for relationships between different types of data. Ever wondered how Sea Surface Temperature and Chlorophyll concentrations are related? Use the interactive tool to see how. The Earth Observatory offers current information about Earth science through images updated multiple times daily, articles, fact sheets, blogs, and animations. Experiments are activities for educators. The Global Maps section contains movies that show seasonal change in things like plant growth, cloudiness, and rainfall. 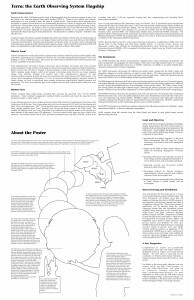 Articles about current science and fact sheets are in the Features section. All articles are reviewed by NASA scientists to ensure scientific accuracy. The Images section offers satellite images that show new scientific findings, current events, or simple beauty. 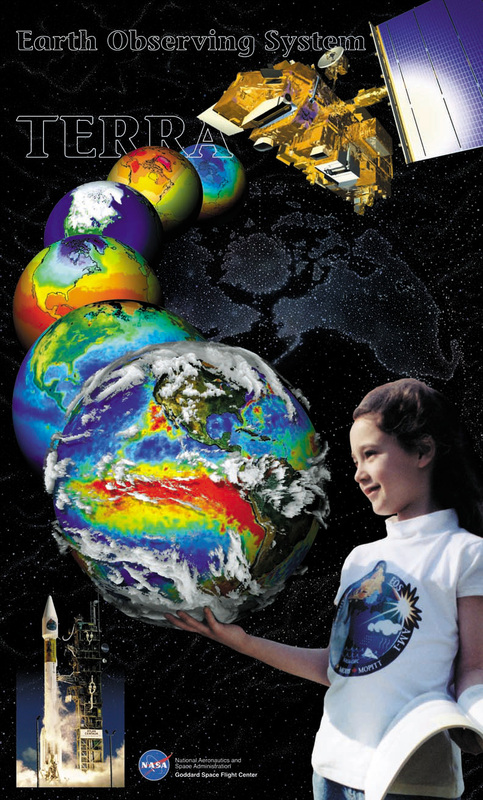 Earth Observatory for kids highlights current topics in Earth science and remote sensing while making the science fun and engaging for children between 9 and 14 years old. Each month a new issue is published and coupled with a hands-on activity. 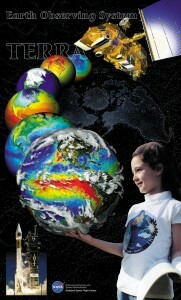 Earth Observatory for Kids asks children to come explore our Earth with us. NASA Earth Observing Fleet (as of February 2015) – This animation shows the orbits of NASA’s fleet of Earth remote sensing observatories as of February 2015. Monthly Water Vapor (Terra/MODIS) – Monthly Terra/MODIS water vapor maps, January 2005 to 2013. 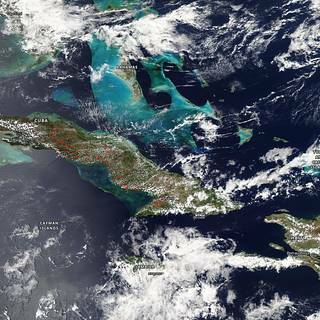 Monthly Cloud Fraction (Terra/MODIS) – Monthly Terra/MODIS cloud fraction, January 2005 to 2013. Monthly Cirrus Reflectance (Terra/MODIS) – Monthly Terra/MODIS cirrus reflectance, January 2005 to 2013. Monthly Cloud Optical Thickness (Terra/MODIS) – Monthly Terra/MODIS Cloud Optical Thickness, January 2005 to 2013. Monthly Cloud Particle Radius (Terra/MODIS) – Monthly Terra/MODIS Cloud Particle Radius, January 2005 to 2013. Monthly Aerosol Optical Thickness (Terra/MODIS) – Monthly Terra/MODIS Aerosol Optical Thickness, January 2005 to 2013. Monthly Carbon Monoxide (Terra/MOPITT) – Monthly Terra/MOPITT Carbon Monoxide, January 2005 to 2013. Monthly Aerosol Particle Radius (Terra/MODIS) – Monthly Terra/MODIS Aerosol Particle Radius, January 2005 to 2013. Monthly Solar Insolation (Terra/CERES) – Monthly Terra/CERES solar insolation, July 2006 to 2013. Monthly Net Radiation (Terra/CERES) – Monthly Terra/CERES net radiation maps, July 2006 to 2013. Monthly Reflected Shortwave Radiation (Terra/CERES) – Monthly Terra/CERES reflected-shortwave radiation, 2006 to 2013. 16-Day Vegetation Index (Terra/MODIS) – 16-Day Terra/MODIS vegetation index maps beginning February 18, 2000. 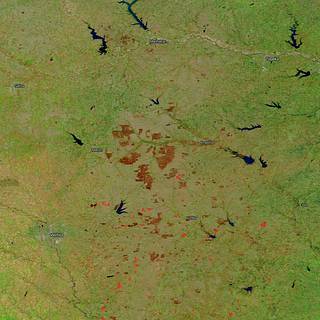 Monthly Vegetation Index (Terra/MODIS) – Monthly Terra/MODIS vegetation index maps, February 2000 to 2013. 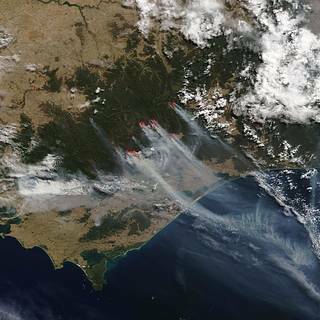 Global Fire Observations and MODIS NDVI – Sequence of global fires as seen by NASA’s MODIS instruments from 2002 – 2011. Mapping the Fire Intensity Record for United States (2000 through 2013) – Mean Fire Radiative Power (FRP) from the MODIS Climate Modeling Grid fire products. The Citizens and Remote Sensing Observation Network (CARSON) is designed to show citizen scientists how to explore satellite data to make wide-scale environmental observations. Each chapter of the CARSON guide includes instructions for a local observation and an extension to make the same observation on a global scale using satellite data. For details on the logic behind each of Terra’s data products, refer to the listing of ATBDs. These are technical documents describing the process by which the Terra data products are produced using the radiance and reflectance information collected by the five on-board sensors.